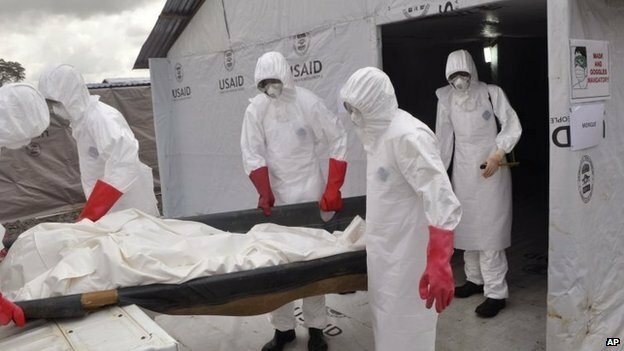 The head of the UN Ebola response mission in West Africa has told the BBC there is still a “huge risk” the deadly disease could spread to other parts of the world. Tony Banbury declined to say if targets he had set in the fight against Ebola, to be achieved by Monday, had been met. The targets were for the proportion of people being treated and for the safe burial of highly infectious bodies. The UN boss was speaking in Freetown, one of the worst-affected areas. On Sunday in Sierra Leone’s capital, bulldozers were clearing large areas for a new burial ground. At the clearance site, near a rubbish tip, car after car was arriving with bodies, and several hundred workers were digging graves. In October, Mr Banbury told the UN Security Council that by 1 December, “70% of all those infected by the disease must be under treatment and 70% of the victims safely buried if the outbreak is to be successfully arrested”. This interim goal – the ultimate UN goal is zero Ebola deaths – was set to try to bend down the upward curve in the graph of cases. Mr Banbury said the 70% targets were being met in “the vast majority” of areas in the three worst-affected countries – Guinea, Sierra Leone and Liberia. “But in some areas”, he said, “including here in Sierra Leone – especially in the capital Freetown and in the town of Port Loko – we are falling short. And it is in those areas where we really need to focus our assets and our capabilities”. In its latest report on 29 November, the World Health Organization said 6,928 people were now known to have died from Ebola. More than 16,000 have been infected. Between 200 and 300 people are dying every week. Guinea, Liberia and Sierra Leone are by the far the worst hit countries. The American UN boss added that, even so, “there is a huge risk to the world that Ebola will spread. It may spread around this sub-region, or someone could get on a plane to Asia, Latin America, North America or Europe… that is why it is so important to get down to zero cases as quickly as possible”.